The fact that online casinos are open 24 hours per day is one of the main reasons why online casinos are so much better than land based casinos. Some land based casinos will stay open 24 hours per day, but these are not widely available and very few players will ever get the chance to actually visit one of these venues. Online casinos are only ever a click away and there are now literally thousands available for you to choose from. It’s just so convenient to visit an online casino compared to the effort that you have to put in to play in a real bricks and mortar casino. You can just switch on your computer and then you can be playing on your favourite table or card game or favourite online slot machine in no time at all. You don’t have to get changed into a smart suit or dress. In fact you could stay in your pyjamas if you really wanted to, which is something you couldn’t get away with in a land based casino. Some people have to drive for an hour or more to visit their local casino, but they are never more than two minutes away when playing online, which is another obvious reason why playing online is so much better than playing offline. One of the only real downsides to playing online is that you only ever get to watch the action through a monitor or screen and you don’t actually get to fully immerse yourself in the action like you can at a real casino. The personal experience of playing in an online casino can also therefore be a lonely experience for some players. You can’t interact with other people directly and you can take in the sights and smells that a real land based casino offers, but once you get past this, online casinos can be just as fun as their land-based counterparts. One of the other benefits to playing online is that you can take advantage of so many great casino bonuses and promotional offers and you can benefit as a real cash player thanks to the attractive loyalty rewards programs. 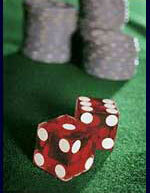 There are very few, if any at all, promotional offers available at most land based casinos. When playing online, you can generally claim one or more bonus offers each and every day of the year. These bonuses include free spins bonuses for selected slot machines, deposit bonuses, cash back bonuses, double loyalty points bonuses, anniversary bonuses and much more. When playing online you can also take part on online casino tournaments (usually online slot tournaments or online blackjack tournaments), so head over to our online casino review section right now and find out where you can start playing today.